While Istanbul might not be the capital of Turkey, it certainly is the largest and probably the most well-known. 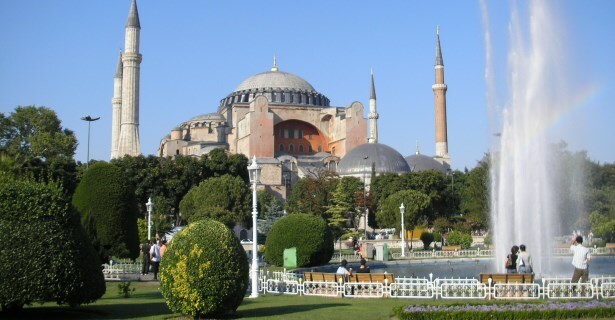 Formerly Constantinople, as the song goes, Istanbul is rich in historical, religious and culturally enlightening sights. With more than enough accommodation in Istanbul, apartments for rent or cheap hostels in Istanbul, Turkey to choose from, visitors can benefit from some wonderfully competitive prices. The apartments in Istanbul offer some of the most competitive rates while 5 star hotels in Istanbul will quite obviously involve a larger expense. Leave your hotel in Istanbul behind for the day and explore the many wonderful historic parts of the city, where there are lots of things to do in Istanbul. The Kariye Museum (The Chora Church) is considered to be one of the finest examples of a Byzantine church. It was converted from a church into a mosque in the 16th century and, in 1948, became a museum. The Hagia Sophia Museum / Church (Ayasofya) is a truly superb structure with more than 30 million gold tiles lining the interior. This important historical building was built back in the 6th century so it’s easy to understand why so many people marvel at the amazing architecture. Other popular religious sites that tourists enjoy visiting are the Suleymaniye Mosque, the Rustem Pasha Mosque and the Basilica Cistern. A walk through the Sultanahmet District is also fascinating for tourists and important places like Topkapi Palace and the Blue Mosque are found here. For a little something different, make sure that you visit the Rumeli Fortress. It was built back on the Bosphorus in 1452 as a form of protection against advancing ships. The Maiden’s Tower (Kiz Kulesi) is another popular tourist attraction. According to local legend, a princess was locked up in this tower to protect her from being bitten by a snake. Over time, the tower was used for a number of purposes including a lighthouse, customs station and even as a retired naval officers’ residence. The Rahmi M. Koc Museum is the first of its kind and is dedicated to the history of transport and communications. This is a lovely place to explore with the whole family and is suitable even for young children. The Istanbul Archaeology Museum opened in 1891. It is Turkey’s first museum and also one of the largest in the world. It has over one million works on display including those from Greek, Roman and Byzantine cultures. Miniaturk is another wonderful place to take the whole family. This park has miniature versions of all the country’s top structures. There are over 100 models to be viewed and enjoyed by all. If you want to escape the busy city for a while and enjoy some greenery, take a trip to Emirgan Park. There are beautiful fountains, lush greenery, picnic areas and so much more for everyone to enjoy. It’s a great place to let the kids run out some of their pent up energy and give parents a much needed break. There are a number of cheap hotels in Istanbul and the offers are even better when you search and book online. For anyone trying to choose where to stay in Istanbul, and find the best hotels in Istanbul, online browsing is a whole lot faster and easier from the comfort of your own home. Keep an eye out for all those amazing Istanbul hotel deals available only to online customers.